This sketch shows the ideal plan for the Hyperion-Glendale Bridge redesign as presented by the #VisionHyperion coalition of advocates. To see the rendering full size, click #http://enrichla.org/the-jewel-at-hyperion/##here##. Thanks to a powerful grassroots effort, organized largely on the Internet with an assist from Los Angeles Walks and the Los Angeles County Bicycle Coalition, one of the city’s most depressing road-design projects is becoming an example of what happens when a community demands better from the city’s engineers. Streetsblog will have more on the Landbridge at Figueroa on Monday. Last fall, news broke that when the Hyperion-Glendale Conference of Bridges would be retrofitted to make them earthquake-proof; local advocates immediately noticed problems with the new design on the street portion of the bridge. Despite appearing on the city’s bicycle plan, the road redesign called for widening the existing car lanes, installing “crash barriers” in the middle of the bridge, removing a sidewalk and no new bike lanes. After an explosion of public comment and a community forum which turned into a Livable Streets rally, the local City Councilmember, Mitch O’Farrell, announced a citizen’s advisory committee would be formed. The Mayor’s Office submitted a request for an extension to the grant. The old timeline would have precluded any major changes to the proposed road design. “It is important for the community to weigh in because we all want the best possible result for pedestrians, bicyclists, and motorists,” O’Farrell told Streetsblog when the committee was created. But creating the community pressure to upset the timeline and the status quo was a result of pure advocacy. “I think that we were all surprised by the rapid organization that happened around the Hyperion Bridge,” writes Matthew Mooney, one of the organizers of the successful strategies to encourage local neighborhood councils and community groups to support a progressive design. The committee met last week and the Los Angeles Department of Transportation presented three options for the design of the bridge. All of them included bike lanes and a road diet of some sort. One included sidewalks on either side of the bridge instead of just one side. In short, the battle over the bike lanes is over. There will be bike lanes on the Hyperion Bridge, not just facilities on parallel bridges. The question now is how many mixed-use lanes will there be and will the sidewalk be on both sides of the bridge. And despite the framing by supporters of car-first infrastructure design, this might be the larger question. So there’s two stories here, the first is that the process created by political advocacy is being taken seriously by the city, the second is that the Bureau of Engineering and City Council offices are making sure that the process actually takes into account the work and opinions of the community representatives. In short, the process is working. Given the institutional support that existed for just completing the $50 million retrofit of the bridge just a couple of months ago, even getting assurances that bike lanes are a probability is a major victory. Both local City Councilmembers and Mayor Eric Garcetti appeared in a video promoting the project as it previously existed. While Assemblyman Mike Gatto and Glendale Councilmember Laura Friedman both weighed in against the project, the political balance was tipping towards the original design. There is still a small chance that the work of the advisory committee and city staff will be scuttled if the timeline extension application is denied. Staff with the Mayor’s Office both believe the application will be approved and are getting positive feedback from Caltrans. “At this time, we have not had any official response to our request for an extension,” Deborah Weintraub, Interim City Engineer, replied to a direct request. This sketch by O’Grady shows the three designs on the table. Currently, it seems as though there is more institutional support for options A or C (as presented in the image above.) The first option maintains the number of mixed-use travel lanes and is reportedly a favorite of Council Member Tom LaBonge, who represents communities on one side of the bridge. Option C allows for the best mixed options and is the only option which includes two sidewalks and two bike lanes. 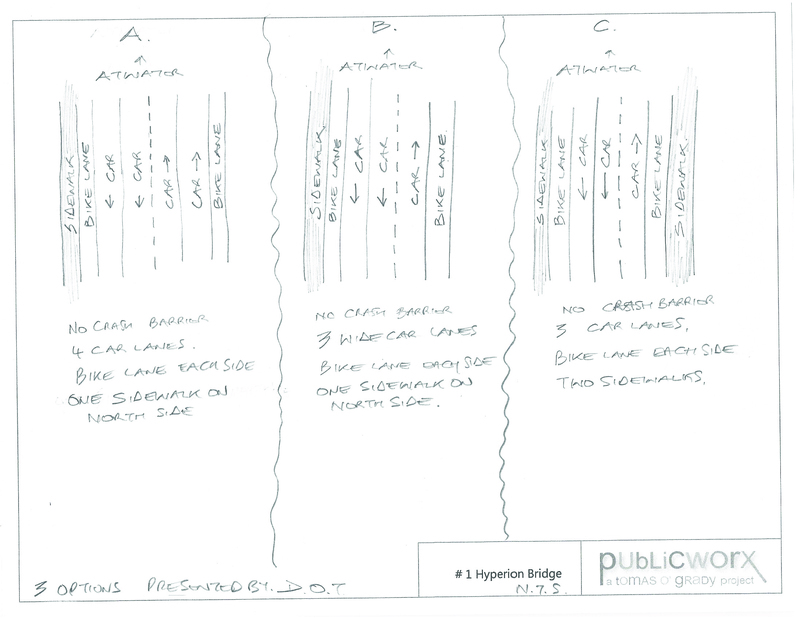 Ward also notes that without a sidewalk on the south portion of the bridge, a pedestrian would have to cross up to 5 signals to get from a point in Silver Lake, to for example, the new Red Car park on the south side of the Hyperion Bridge on the Atwater side. This trip would require about 2200 extra feet of walking, and isn’t in line with a goal of improving pedestrian access across the L.A. River. To sidewalk or not to sidewalk, that is now the question. But the victories that have already happened are opening space for people to dream even bigger. “Imagine having dinner on Rowena in Silver Lake and then taking a stroll with the kids across the bridge, stopping to enjoy the river views and having dessert in Atwater Village? Why for goodness sake do we all go to the “Americana” when we can have our own promenade starting at the restaurants of Hyperion/Griffith Park Blvd. and ending in the beautiful downtown of Atwater Village,“ writes O’Grady. Currently, mostly children with brown faces use the bridge everyday to walk to and from school. There needs to be sidewalks on both sides of this bridge. We need to reject LaBonge’s “truck route” A design. Leaving all four lanes car lanes will give us the same crummy bike lanes we have on Sunset and will not encourage people to get out of their cars or make this bridge safer for pedestrians. Whenever I see a street with a different number of lanes in each direction, I wonder why they chose that particular configuration. Is the southbound direction usually more congested than northbound over the bridge? Or conversely, do the northbound lanes flow into a more congested area than the southbound lanes do? 2 lanes up hill 1 lane downhill. The improvements to the plan are great and the access to the LA River path will be a boon for the surrounding neighborhoods. However, I do have to say this has nothing to do with “equal rights” it has to do with the best use of a public roadway to service all that use it – not just pedestrians or bikers )whatever the color of their faces), but also motorists. To place 3 car lanes on the bridge will make a bad traffic situation even worse. There will always be exponentially more car traffic on the bridge than pedestrians or bikes. The 4 lane plan is a great compromise allowing for a wider sidewalk buffered by a bike lane while not causing traffic headaches. As far as getting people out of their cars – I don’t think the variations in the 3 plans is going to make that much of a difference. What evidence do you have that it will make a “bad traffic situation worse”? first of all, according to the study done by the DOT, AVERAGE surveyed speeds are 55mph. That would indicate that there is NO “bad traffic”…. and in fact a traffic density issue. lets do this scientifically, not “gut thinking” there are plenty of examples where removing a traffic lane actually makes the street in question more orderly and safer for ALL users. The bridge engineers say in their own report that during construction they can remove a travel lane in each direction and produce no measurable impact on motorist delays on the bridge (this is paraphrased). The engineers also say that there is not going to be population growth nor any other factor that would see traffic volumes rising on either side of the bridge. So what “traffic problem” are you talking about here? Thank you Mooney, Ward and O’Grady for your dedication to our city and neighborhoods. We love LA. I assume you mean Hyperion southbound? Anyway, no version of the design allowed for that, and every version (including these modifications) include a reconfigured exit from the I-5 North, allowing left turns onto Glendale southbound as well as right turns onto northbound. Cars can take advantage of this to then turn west on Rowena and then south onto Hyperion – I don’t know if the net result will be any more convenient than the U-turn at Glendale/Glenhurst/Glenfeliz, but it will be an additional option (especially for anyone with a destination actually on Glendale, Rowena, or Silver Lake). But the real point of this effort, I thought, was always the seismic retrofit.